Functional Fitness is a term you hear more often in recent years, especially in reference to fitness training for older adults. But don't worry, just because it's a new term, doesn't mean it's one more thing you have to make time for in your day. Functional fitness is all about training your body for life, rather than for a specific sport or for a certain esthetic appearance. It's especially helpful for older adults because it addresses muscle imbalances and asymmetries, and it trains your body to move in the ways we move in everyday life. There are five basic movement patterns that we use in everyday life. Let's look at each movement and how we can train to improve that movement pattern. 1. Bend-and-lift movements. In the gym we call it squatting, in everyday life it's getting in and out of a chair or squatting down to lift a bag of groceries from the floor. Bend and lift movements require strength in the glutes, quads, and hamstrings, but also plenty of stability in the core, and flexibility in the knees and ankles. 2. Single-leg movements. You'll often train single leg movements in the gym with a variety of lunging movements. In real life, single-leg movements are called for when you walk, when you climb or descend stairs, or when you bend and reach forward on one leg to get something from the floor. Like the bend-and-lift movements, single-leg movements require combined strength, stability and flexibility with an added element of balance over a changing center of gravity. 3. Pushing movements. Pushing movements typically involve your upper body pushing forward (opening a store door) pushing overhead (putting an object on a high shelf) or pushing to the side (lifting your torso from a side-lying position). In your workout you can train for pushing movements with pushups, overhead presses or side planks. 4. Pulling movements. Pulling movements in your activities of daily living might include pulling the car door shut, pulling the sheets down from the top shelf of the linen closet, or pulling your suitcase off the floor. In your workouts you'll train for pulling movements by developing core stability, strength in your back and shoulders, stability in your shoulder blades and flexibility in your shoulders. 5. Rotational movements. 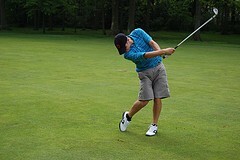 Your thoracic spine rotates with every step you take and any time you swing a golf club or tennis racket. Any time you reach across your body or twist through the spine, you're engaging in a rotational movement. This complex movement pattern requires a great deal of core stability and strength to support the spine during the rotational motion. You can certainly train each muscle for strength and endurance in isolation, but functional fitness trains muscles and joints to work together during complex movement patterns involving multiple muscles and joints at once. It's how we move every day, and training your body to move well can improve how you feel every day.